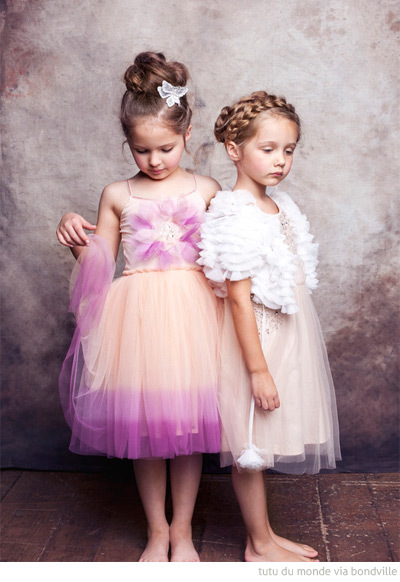 One of my favourite Australian labels for girls is the ever-beautiful Tutu du Monde. There isn't a piece I don't love from any of Andrea's collections and this exclusive sneak peek of two tutus from the 2013 collection is no exception. These are the Dew Drop Tutu in Frangipani with Enchanted Butterfly Hairclip and the Silver In the Spotlight Dress in Biscotti with Plie Caplet in Offwhite. The girls are gorgeously photographed by the amazing Alexandrena Parker (whose work photographing children I am more than obsessed with). I was imagining two sweet party girls in these Tutu du Monde concoctions and was inspired to pair them with some fun party decorations. Enjoy! I love these pretty inspirations! The party will be so awesome.